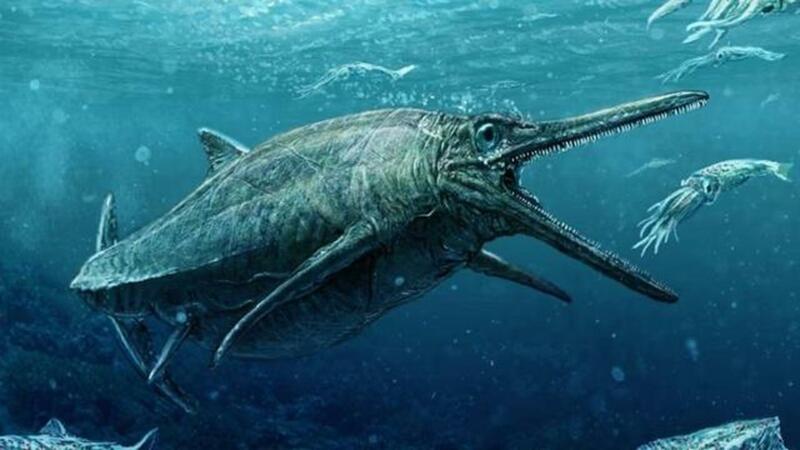 A 164-million-year-old fossil of an ancient marine animal called the Storr Lochs Monster has been unveiled by researchers in Edinburgh, Scotland, reports the BBC. According to a report by The Telegraph, scientists say it is the most complete skeleton of its kind that has been found in the country. Experts believe that the remains belong to an ichthyosaur which one of the researchers has stated, "ruled the waves while dinosaurs thundered across the land." The creature is estimated to have been about 13-feet long with a sharply protruding snout and "cone-shaped teeth." While the fossil had recently been unveiled to the public, it was discovered about 50 years ago by the manager of a local power station; he sensed the significance of the find and contacted a museum to collect them. Now, a team of experts from the University of Edinburgh and National Museums Scotland has been formed to further analyze the remains for insights into the creature's evolution "during the Middle Jurassic Period."